I don't know what else to call it, but I'm referring to the little caged in area on the loading platform where you can stash your kids while you ride. When I was little and went to Kings Island with parents they would stuff me in that cage on The Beast and Vortex while they rode. Once I was big and brave enough to ride I stopped paying attention to it, and as the years went by I completely forgot they were there. During BeastBuzz I was telling my wife about them and I was skeptical that they still had themor that anyone actually used them. I figured that today's parenting climate is a little more uptight about leaving kids unattended than it was 15 or 20 years ago. Lo and behold, we get to the platform on The Beast and see a kid locked in the pen! There was an older girl with him--maybe late teens or early 20's--so I thought that maybe they had a policy where children under a certain age had to be accompanied by someone older, so I asked the ride op how the system worked. She said that that wasn't the case and that there was basically no age limit on who is allowed to be left behind, other than what common sense would tell you (can't leave an infant in there, obviously). I was pretty surprised by this. I'm assuming that Vortex still has its cage and that it still gets used. However, the one for The Beast had no sign on it and there was nothing in the brochure about it. I know the park has its parent swap program, but if it's just the two of you with your kids then each of you has to ride alone. So, does anyone use these pens with their children? Has anyone seen them at another park? I can't think of any; as far as I know, it's limited to Kings Island and those two rides. Doesn't Texas Giant have a "chicken coop" or something similar along those lines for people who are too scared to ride? Flight Deck (KI) has one also. I've heard them called 'penalty boxes'. Are you obligated to retrieve your kids, or can you leave them there for the day? I don't understand the mentality here. My wife and I are pretty selfless parents. We had kids and we understand that changes what you can and can't do. Riding coasters together is one of those things. And given the relatively low importance of riding together vs the relativley high importance of being there for your kid - this feels icky. Add in the fact that parent swap is available and it gets ickier. "No, Billy. Mommy and Daddy want to ride this coaster...together, so you have to stay here with all of these strangers while we go have fun...but you can watch us!" It's just not me or my style. I tend to think parents are more selfish than ever these days and this is a good example. Although if this has existed that long, maybe it's not as different as I think. When my kids were younger we made a point to travel with others so that there were always combinations of people that could ride. If one of us didn't get to ride something it was no biggie. I can't imagine caring that much that I got on a ride and don't even come close to understanding the need to not only ride being so strong, but ride together that I leave my kid at the station to do so. Might just be me. My kids come first. It's worked well so far. Yeah that's how I feel for the most part. We've taken our 3-year-old to Kings Island twice with the sole intent of spending the day in Planet Snoopy and letting her experience everything. I managed to squeeze in a ride on Diamondback and The Beast and we used parent swap so my wife could do the same. It can be a teachable moment because you can demonstrate to your child that when you're with a group, not everyone is going to agree on everything, so sometimes you'll have to participate or be patient and wait while others in the group do what they want to do, then when it comes time to do what you want to do the others would be expected to show the same courtesy. One instance where I could see the penalty box (I'm going with that one cuz I like it) come into play is when the kid is tall enough to ride, commits to riding, but bails at the last moment. Should someone who's waited an hour to ride have to bail out too, or is it ok to stick'em in the penalty box? I guess I don't have a firm stance either way. I'd lean more toward the latter, but I could entertain an argument against it. Well, I was a (step) parent for a while and through our girls tween years we'd find that maybe one of them didn't feel like riding, or didn't like it, or whatever. She was always fine stepping through and waiting in the box until the rest of us came back. The parks like it because it keeps the kids off the exit ramps and up outta the way. The parents like it because it gives some semblance of supervision. The kids like it too, because they can sit there, usually with other kids and watch other riders get on and off thru a couple of cycles. Now I would not care for or approve of this under two circumstances. One, if the child is too young to be left alone. (My girls were always old enough and responsible enough to manage themselves for 2.5 minutes, and we figured better on the station platform than out on the midway) or two, if the kid is screaming that they dont want to be left, and I have seen this happen. Responsible ride ops will keep their eye on the situation over there and make appropriate recommendations if necessary. I've seen ride ops stand by the enclosure and wait with the child, too. I had to let a lot of occasions pass by when kids were involved in my life. But having a service like this allowed everyone to participate when they felt like it, and allowed us all to stay together while in queue, and I never once felt like a bad parent on account of it. Self-imposed caging, I'm fine with. We didn't go to amusement parks for a few years when our kids were really young. Then when we did go, we stuck with kiddie/smaller rides. A couple of visits, I snuck off to ride a bigger coaster. Was easy to do because my wife had (and has) no interest. But I always had a great time riding whatever rides they wanted to ride. That being said, I can see the appeal of the kiddie cage. You can spend a lot of time in a line talking with your kids. Its only the 2-3 minutes that you are actually riding where they cannot be (or refuse to be) with you. Better than leaving them on the midway for the line plus ride time. Time your kids are with you (and interested in being with you) is short. To me, its worth taking advantage of every second of that time before its gone. But I know other parents have different views of that. So be it. As a single parent I have used the penalty boxes or had my kid wait on the exit ramp just outside the station. I felt bad having to do it, but not bad enough not to do it. I finally just forced my kid to ride everything with me regardless of how huge the coaster was. Kidding... I gently coasted her into riding larger and large stuff. 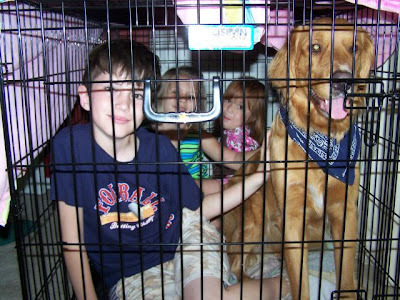 I always thought those cages were for people who REALLY wanted to engage in "child swap." I'm not talking about waiting for your party to switch guardians while the other members of your party ride, I'm talking about parents who say "I am DONE with this child, I'm willing to switch with virtually anyone else at the park." To mis-quote Melville..."Call me Carrie...."
I have been to KI about 5 times and for the life of me, don't remember seeing these cages. Does anyone have pictures of these cages? I'll echo what Gonch said. We probably go to parks more than we used to, but we do different stuff. Sometimes we're lucky to go with a close friend, and we can ride together, but I would never leave him alone. That's lame. sws, your picture made me cry a bit. Then my life is now complete. No, it's not. The agreement was to get him to stop posting, not to make him cry. Late to the party, but yes, NTG has a "chicken coop" which used to make chicken noises when its gate opened and closed. Kids now days have it cushy. Why, when I was two my parents left me in the station wagon at carnivals. Twice at KI they handcuffed me to Tumblebug's fence while they rode Racer. And I was happy to be there.